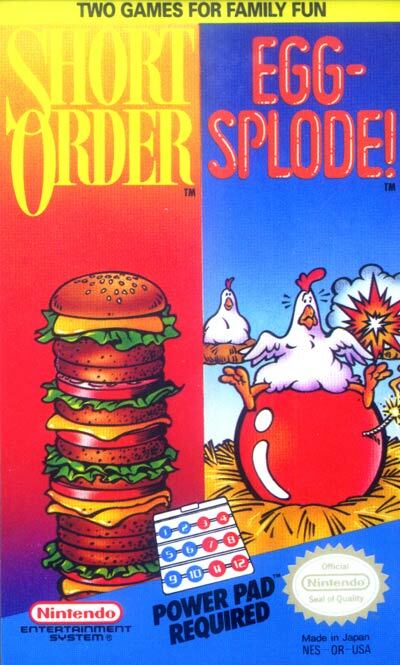 One of a handful of games designed exclusively for use with Nintendo's Power Pad (a floor mat with 12 large, touch-sensitive buttons), Short Order/Eggsplode for the NES features two games in one Game Pak. Short Order has you working in a hamburger shop, trying to please customers by building their burgers (which consist of meat, cheese, lettuce and tomato) in the same sequence in which they were ordered. When an animal comes into the shop, he will order a hamburger with three ingredients; then he will keep adding an ingredient with each successive turn. The bigger the animal, the more ingredients he will eventually want on his hamburger. For example: mice are satisfied with their order at 10 ingredients while pigs keep going until they have ordered 99 ingredients. In two-player mode, one player assumes the role of a fox while the other plays a dog. Contestants take turns ordering hamburger ingredients until one player gets the sequence wrong three times. In Eggsplode, a scheming fox has sneaked into the chicken coop and is looking to raise some ruckus with the hens by planting bombs under them. The hens' nests are laid out in the same sequence (4x3) as the spaces on the Power Pad. When a fox plants a bomb under a chicken, you must step on that bomb. When the game begins, there is one fox with 10 bombs, but as the game wears on and gets faster, it progresses up to three foxes with 60 bombs.